The elemetary computer lab consists of 32 up-to-date HP Windows 10 Professional desktop computers. In an effort to enrich the classroom curriculum, teachers instruct students to use programs and software like Microsoft Office Suite, Hyperstudio, Kidspiration, Inspiration, Timeliner, Neighborhood Map Machine, Kid Pix’s and Math Munchers. Additionally, high-speed Internet access allows students to utilize the World Wide Web for Accelerated Reader, Unitedstreaming, Powerschool (our web-based information portal), the Michigan e-library, web 2.0 tools and many other educational and interactive web sites for research and curriculum-related purposes. Wired to a schoolwide network, the computer lab allows students and teachers to begin projects in the lab and continue and/or finish them in their classrooms. The lab is also equipped with a multimedia projector that enables teachers to model software skills and promote appropriate computer use for students. Kindergarten through sixth-grade students visit the computer lab once a week for 40 minutes. During this time, lessons are implemented that meet the state and diocesan standards and benchmarks for technology and computer skills. Students in third through sixth grade spend an additional 20 minutes per week in the lab practicing keyboarding skills. 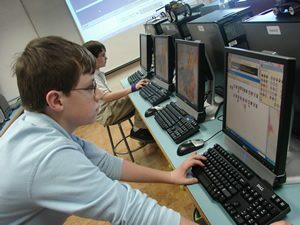 Seventh- and eighth-grade students use the computer lab on an as-needed basis. Our school library consists of over 11,000 titles covering a wide range of fiction and non-fiction titles. From children’s picture books, early readers and a young adult section to an extensive non-fiction section, the library provides resources that support the K-8 curriculum and promote recreational reading. 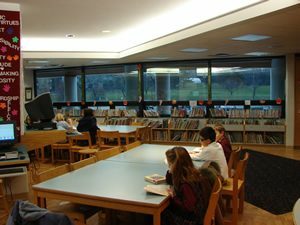 The library is fully automated with an electronic card catalog and computerized bar codes to facilitate a smooth check-out process. For the second- through sixth-grade students who participate in the Accelerated Reader program, all eligible books are clearly marked with AR stickers. To aid in research projects and assignments, students also have access to online databases available through the Michigan e-Library. Preschool through fifth-grade students visit the library once a week for 30 to 40 minutes. Sixth-, seventh- and eighth-grade students have a 45-minute period once a week.